Hyundai Santa Fe next gen variant was recently spotted by WorldCarFans photographers while undergoing winter testing. 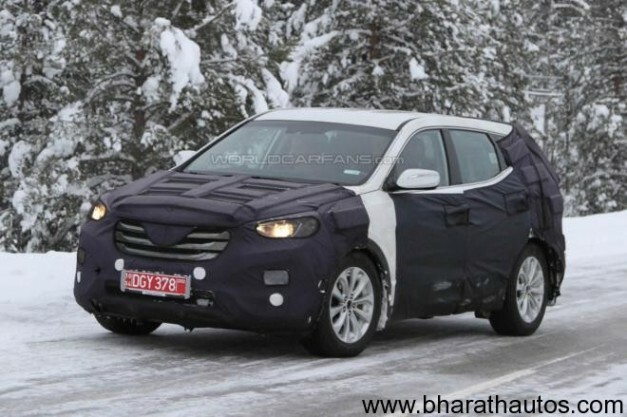 According to the report, Hyundai test drivers were testing the Santa Fe SUV in the Arctic Circle in Scandinavia. While this model will retain its name as Santa Fe for US markets, it will be in Europe that it will be known as ix45. Though considering the location, the cars were in total concealment but it took an eagle eye to decipher its special styling on the front façade which had three horizontal chrome grill bars which is also seen on the current model. The new model will also have a third row of seating for 2 additional passengers. Despite all efforts to keep the upcoming model under wraps, engine details would include a turbocharged 2.0-liter four-cylinder petrol engine with 274 hp and 364 Nm of torque and a Euro6 2.0-liter diesel engine rated at 150HP. Auto enthusiasts can expect to see the new Hyundai Santa Fe at the New York Auto Show this April. Previous articleMahindra XUV 500 bookings to reopen in 2 days, no W8 AWD variant though!